There’s stuff out there that must be done! And so she set off at a run! “Mum I’m going to leave the Kei! Its fab to see your wings unfurl! 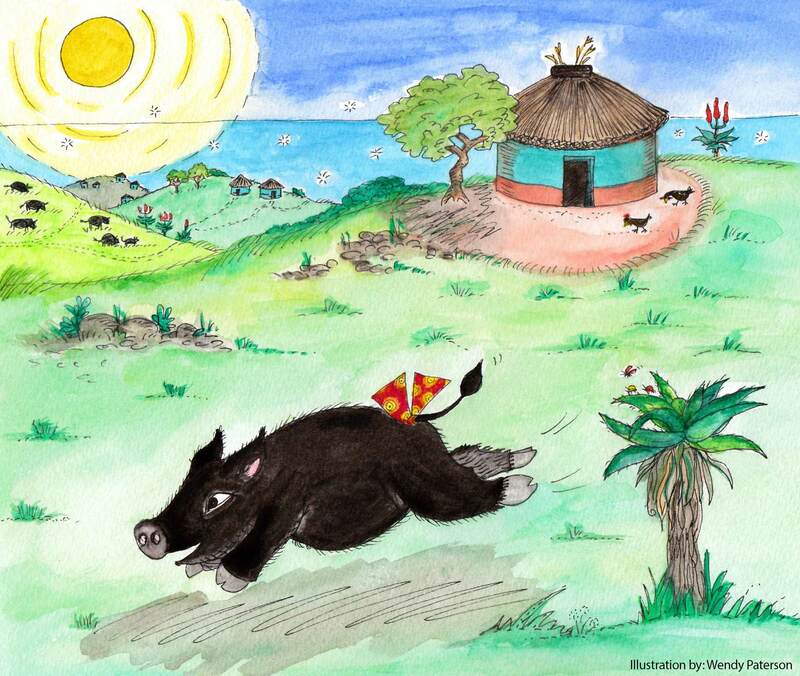 Its time for Thembi pig to fly! How lovely was this Transkei land! By sundown she was too tired to stand. I knew you’d turn up in the night! Perhaps a little lily liver? “Come on Thembi, pigs can swim! She swims like magic, I tell no lies! Urgent need to be a –mealing! Were there quitters? Never one! Did they give up? Never, NOT! The adventure bug has bitten! She will never be deterred! Yebo yes these 3 think big! What will this new plan deliver? Should we play some more “I Spy”? But it helps the trip to quicken! From this place adventure calls! Their first attempt an Epic Fail! A few weeks passed, they tried again. This Pig has endless expertise! Happy to have made it? Lank! Barbel braaied on coals! Delish! Barbel, just what Dr ordered! Before the herd is off again! Maybe next the Kruger Park? Hayibo! that would be a lark! “JISLAAAIK! look at that you okes! This must be one of nature’s jokes! This story wouldn’t run its course! The men must have some evil planned! These okes will wish they’d not been born! Our 3 heroes we salute! The herd made certain that they failed! To fail would be a loss for us! For now we bid you au revoir!